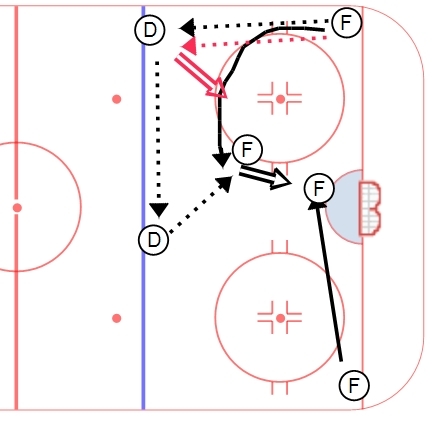 This week’s drill is a half ice shooting skills drill involving both forwards and defensemen. The drill begins with forwards in both corners and defensemen manning the points. The forward on the strong side passes to the D, who moves it D-D. The forward then rolls through the high slot for a pass and a shot. A forward comes to the net front from the opposite side. After this is executed, the forwards stay in front of the net while a second puck is passed to the strong point for a point shot. The drill then begins again from the other side of the ice. Skills worked on in this drill for forwards should be catch and release, goalie screen, and shot tipping (both high and low). Defensemen should work on moving the puck with their eyes up, making hard accurate passes, and getting pucks to the net with traffic.